U.S. EPA chief Scott Pruitt and President Trump have appeared on national television to warn Americans that if coal power continues to decline, the lights could go out. But real-life examples and an expansive body of research by grid operators, engineers, nongovernmental organizations and scientists suggest that's an exaggeration.Yesterday, Pruitt said if the share of coal use falls below 30 percent nationally, it could expose the United States to terrorist attacks. 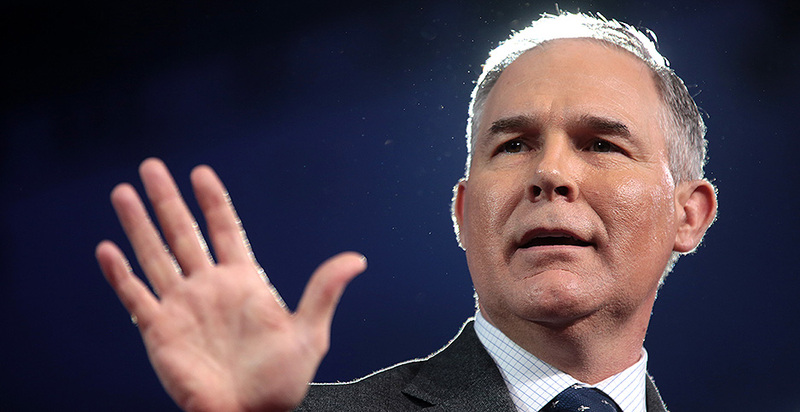 "When we're at less than 30 percent or right at 30 percent today, that creates vulnerabilities to attacks on infrastructure," Pruitt said yesterday on MSNBC's "Morning Joe," without specifying what kind of threats he meant. "As we generate electricity in this country, it is not a wise thing to limit the number of resources. It creates vulnerabilities. We need more diversity from coal, natural gas, oil, hydro, nuclear, across the board," he continued. Trump, in his announcement that the United States would exit the Paris Agreement, said renewable growth could put the country "at grave risk of brownouts and blackouts" (Climatewire, June 2). EPA did not respond to requests to provide Pruitt's sources on this issue. But both statements align with a broader theme from the administration and an upcoming Department of Energy study about whether renewable power is causing problems for coal and nuclear and jeopardizing grid reliability. "The impression I got was that he's using exactly the same language about vulnerability for plants that don't have on-site fuel, and that we're somehow losing diversity," said Sue Tierney, a senior adviser with the Analysis Group and a former assistant secretary for policy at DOE. "Ironically, of course, the system is getting so much more diverse." Nonpartisan grid professionals acknowledge that there are important conversations to have about securing the grid from external threats unrelated to the fuel mix and about controlling costs and handling more complex generation schedules while transitioning to greener power. They aren't as worried about having enough power as the country moves away from coal. They say their extensive planning processes will ensure against outages. Coal power has been on the wane, falling to about 30 percent of U.S. electricity last year, down from closer to 44 percent half a decade ago. Experts widely agree coal plants have closed mostly because natural gas has been so cheap. Pruitt, however, thinks the downturn is a problem for the grid. He argues coal is good because plants can keep stockpiles on-site. During extremely cold weather, natural gas generators in some regions have had trouble getting fuel because they didn't have steady contracts. But coal trains have also been unable to deliver in similar situations. Renewables, on the other hand, don't pose fuel transportation problems. It's true that they can't generate all day, every day, but grid organizers are finding new ways to integrate higher amounts of them anyway. When coal plants shut down, utilities and grid operators make plans to replace their power. Some of them have also looked at expanding their markets so that if they face shortages, they can acquire power from neighbors. Mike Jacobs, a senior energy analyst with the Union of Concerned Scientists, explained that when power providers can buy from a larger pool, they don't have to keep as many facilities waiting at the ready in case of an emergency. "The guys who are making the statements that you can't do it without the old ways aren't in the business of figuring out how to do it," he said. Power outages most often occur because of bad weather or power line failures, not plant closures, Jacobs pointed out in a blog post. Conservative interest groups contend that renewables, and declining coal use, pose risks. The Institute for Energy Research's Travis Fisher, in a report in 2015, argued that renewables are pushing traditional fuels, which he said were more reliable, offline. Fisher is now leading the study at DOE. IER highlighted that "access to reliable electricity is a fundamental part of American life." "We may take it for granted, but when the power goes out, everything grinds to a halt," Fisher's report said. "Inside the house, we lose everything, from the lights, heat pump, refrigerator, television and Internet to chargers for phones and computers. Outside, the stoplights and streetlights stop working. It's impossible to get any work done inside offices and in factories. In short, our daily lives depend on a reliable source of electricity." As he explained, grid planners "go to great lengths to make sure the grid's delicate supply/demand balance is stable, not just minute to minute, but also five and 10 years into the future." At the same time, he argued that the biggest threats to the grid are not natural disturbances or human attacks, but policies that "are shuttering unprecedented amounts of reliable power sources while simultaneously forcing increasing amounts of intermittent, unreliable power onto the grid." Several regions are already making life work with very little coal. Within the New England Independent System Operator, coal accounted for 2 percent of power generation in 2016. "Coal is now largely irrelevant in New England," said Gordon van Welie, president and CEO of ISO New England. "How do we maintain resilience in New England if we don't have coal and everyone else says we need coal to maintain resilience? That just doesn't compute for me. So, for us, though, is the issue is we have enough resources to produce electricity whenever we need it. That's the market design objective. It's electricity on call." The New York and California grids also generate close to no coal power, although they consume some. In the Texas grid, operated by the Electric Reliability Council of Texas, a study by Brattle Group analysts found that continued coal plant closures wouldn't be a problem. The National Renewable Energy Laboratory found that wind and solar could power 30 percent of the Eastern grid without reliability concerns (Greenwire, Aug. 31, 2016). Another NREL study discovered that the Western grid could reach 35 percent wind and solar if utilities coordinate better over bigger geographic areas and schedule power closer to real time. California is hoping to get half of its power from renewables by 2030, meaning an additional 15,000 megawatts of renewable power, according to the California grid operator. The California Independent System Operator says rapid penetration of renewables is changing the way it operates but is manageable. A recent California ISO study argued that large-scale solar plants with the right technology can "mitigate the impact of its variability on the grid, and contribute to important system requirements more like traditional generators." PJM Interconnection, the grid operator for the Mid-Atlantic and Midwest, said in a recent report that it could eliminate coal use without any reliability problems. The organization is not suggesting that would happen, however, and is continuing to explore what the implications would be for power costs. When states were figuring out how to handle the Obama administration's climate standards for power plants, the Federal Energy Regulatory Commission also took an exhaustive look at the potential for outages under the regulation. FERC essentially determined that the existing processes for ensuring reliability would be enough to avoid brownouts or blackouts. Regulators said the Energy Department would also have authority under the Federal Power Act to give plants some leeway in the rare exception that they needed to stay online. Just a few weeks ago, DOE used that authority to stall closing one unit at a coal plant in Oklahoma. John Moore, energy director at the Natural Resources Defense Council's Sustainable FERC project, called that "a perfect example of how, in a very narrow case, the existing law worked." "Coal supporters are again returning to playing the reliability card because they don't have much left," Moore added.